Statistics is a science, and many people get degrees in it every year. There are many scholarly journals of statistics and there are quite a few "refereed" journals. If there really were a backgammon site with non-random dice, I would certainly think by now that someone would have proven it statistically. What a splash that would make! Not some whining on an internet message board, but an honest-to-goodness valid statistical analysis of the backgammon dice, that was reviewed by statistical experts. Do you think that journals would not publish such an article? Think again. The very first article on the proper strategy in blackjack was published in the Journal of the American Statistical Association (by Roger Baldwin, in 1956). 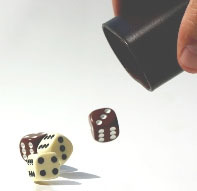 I have no question at all in my mind that if someone could actually prove non-randomness of the dice on any online site, that they could get it published. I have done several analyses on the online dice, but let me share the one that I find most meaningful. I believed that when playing on the MSN Backgammon Gaming Zone, I was dancing more than 25% of the time when on the bar against a 3-point board. So I decided to track it, using pen and paper. And over a couple hundred tried of entering from the bar, I was dancing 33% of the time. Hmmm. Then I noticed something. I rolled the dice and entered, and my opponent rolled, and I realized that I had not made a mark for the roll I entered. I wondered if I could be noticing it more often when I danced but not when I entered. After all, we notice the unusual and frustrating more than the usual and satisfying. So I threw out the old results and changed the way I was doing it. I set a rule that I would not mark down a roll unless I had the pen in my hand at the time I clicked on the dice. That way I would always make a mark, enter or dance. Once I changed the data collection method to ensure that there was no human bias, I found I was dancing25% of the time. Many online backgammon players believe the dice are biased for the same reason the Church persecuted Galileo. If they accept as fact what they know to be true, it threatens their core value system. If they believe that the dice control the game, rather than their own backgammon skills, they don't have to admit that they are not as good as they want to believe they are.